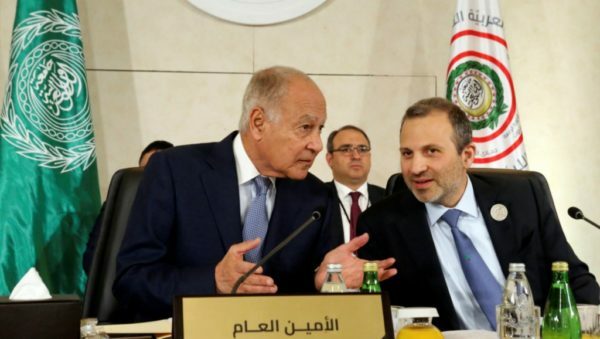 Mohamed Azakir, Reuters | Arab League Secretary-General Ahmed Abul Gheit gestures as he talks with Lebanese Foreign Minister Gebran Bassil, at a pre Arab Economic and Social Development summit meeting in Beirut, Lebanon, on January 18, 2019. Lebanon’s acting foreign minister called for the Arab League to readmit Syria ahead of a regional economic summit to be held in Beirut on Sunday, more than seven years after it suspended Damascus’ membership. The Arab Economic and Social Development Summit, or AESD, is being held in Lebanon for the first time amid sharp divisions in the country and among Arab countries. Syria was not invited despite demands by allies of Damascus in Lebanon. “Syria is the most notable absentee at our conference, and we feel the weight of its absence,” Gibran Bassil , who also heads up the Free Patriotic Movement a close ally of Hezbollah and the Syrian regime said. “Syria should be among us… without us having to wait for a permission for it to return,” he added at a meeting with other ministers from Arab League nations. But in recent years, President Bashar al-Assad’s forces have with Iran, Russia and Hezbollah’s help gained the military upper hand against rebels and jihadists, and efforts to bring his government back into the Arab fold appear underway. Syria’s war has killed more than 500,000 people and displaced millions since it started with peaceful anti-government protests. Seven Arab leaders had been expected at Sunday’s summit but only the presidents of Somalia and Mauritania and the emir of Qatar will attend. “The Beirut shock… a summit without heads of state,” the country’s oldest Arabic-language newspaper An-Nahar said. The conference is set to discuss the digital economy, as well as a long-suggested project for an Arab free trade zone. Lebanon also hopes to put forward an initiative calling on countries in the region to help spread the burden of 1.5 million refugees living on its soil.